CyberSplitter 2.0 Ransomware seems to be another malicious application created by developers who released Cyber Splitter Vbs Ransomware too. However, we cannot consider it to be an upgrade since the infection seems almost identical to its first version. 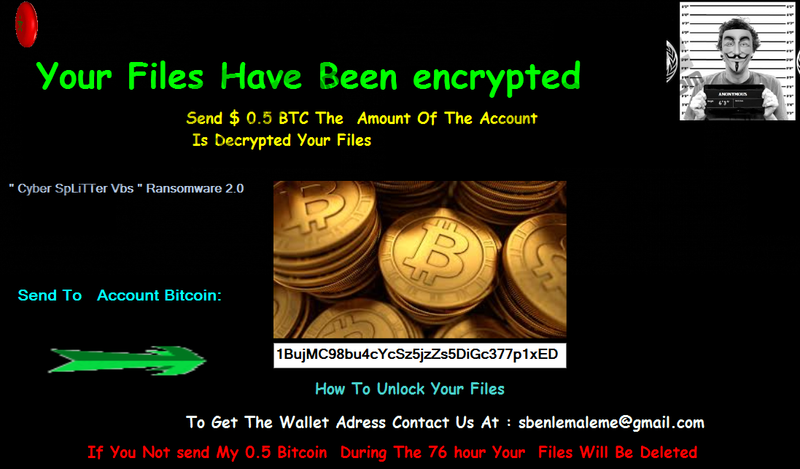 Same as Cyber Splitter Vbs Ransomware this recently created ransomware also does not lock any data on the computer, although its displayed ransom note says otherwise. This time, the threat’s developers are asking to pay a half smaller price, which is 0.5 BTC (almost 390 US dollars), but you should not even think about paying the ransom as your files should be completely safe. Under such circumstances, we would recommend removing the malware at once. If you do not know how to get rid of it, take a look at the instructions located below the text and complete the provided steps to eliminate the infection manually. Same as CyberSplitter 2.0 Ransomware’s previous version or other malicious programs alike, it may enter the user’s system through malicious data sent by email. Despite the received file's appearance (might look like a document, image, etc. ), it could be an executable file, and when it is launched, the malware might settle on the system without your permission. Luckily, this particular ransomware does not begin the encryption process and lock all your important files like other similar harmful software. Thus, this experience is a good chance to learn how to avoid more dangerous threats in the future. Also, it might be a perfect time to think about using a reliable antimalware tool to secure the system. What happens when you launch the malicious file infected with CyberSplitter 2.0 Ransomware? If the application would have the ability to encrypt user’s data, the malware would most likely immediately locate its targeted data and start locking your files, but the way it is programmed now, the threat should open a picture with the ransom note. To be more precise, the malicious program should not harm any data on the system. Yet, the displayed ransom note might say CyberSplitter 2.0 Ransomware encrypted your data, and in exchange of a decryption tool its creators may ask you to make a payment to their Bitcoin account. Additionally, they should threaten users to delete their files within 76 hours. It could be their way of scaring you so you would rush to pay the ransom instead of checking if the ransom note tells the truth. What’s more, the malicious program does not even lock the screen, so you would not be able to check if your files are encrypted. Therefore, it is enough to open a couple of files on the computer to realize that the displayed ransom note lies about locked data. Another strange thing is that unlike other similar ransomware applications CyberSplitter 2.0 Ransomware does not create any Registry entries in the Run key or place any files in Startup folders. This would allow the malware to show you the ransom note each time you restart the computer, but now, it could appear only once. Still, we advise you not to forget about the threat or leave it unattended. The application is still malicious, and it might be safer to remove it from the computer immediately. The manual deletion is not so complicated, provided you remember the malicious file’s title and location of where it was saved on the computer. If you do not, the removal instructions at the end of this text will mention a few possible directories. Our researchers recommend using legitimate antimalware software too as it is a good way to see if there are no other threats on the system. If the antimalware tool would detect anything else besides CyberSplitter 2.0 Ransomware, you could erase these detections together by clicking the removal button. Later on, the tool would guard the system against other malware. Plus, users could use it to check suspicious email attachments, software installers, and other doubtful data downloaded from the Internet. As for those of you who have more questions about the infection or its deletion, we would like to mention that you could reach us through social media or leave a comment below. Navigate to the directory where the malicious file could have been saved, e.g. Downloads, Desktop, and so on. Right-click the file and choose Delete. Locate the ransom note (could be on Desktop), right-click it and select Delete. Quick & tested solution for CyberSplitter 2.0 Ransomware removal.